Well off the beaten path (US1) on the man-made island of Key Colony is where you’ll find this family owned, non-smoking property on the Atlantic. 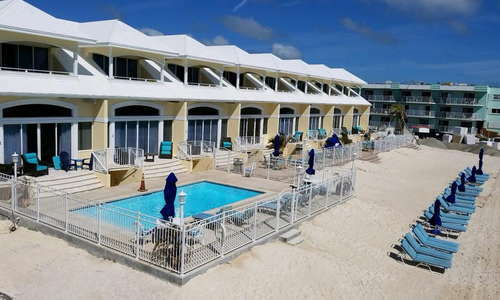 The rooms are comfortable in size and amenities and you can step right out your door onto the sand. Another bonus: They don’t believe in resort fees! The resort will not only recommend local bars and restaurants, they’ll drive you there on their golf cart, and pick you up! Choose a suite--it feels like you’re staying in the modern apartment of a young, ocean-loving hipster. Cool lighting, good Wi-Fi, flat screen TVs, nice furniture, and a sleeper sofa, a full kitchen with granite countertop and bar stools, and a separate bedroom with quality sheets on the king bed. The balcony, however, is shared. 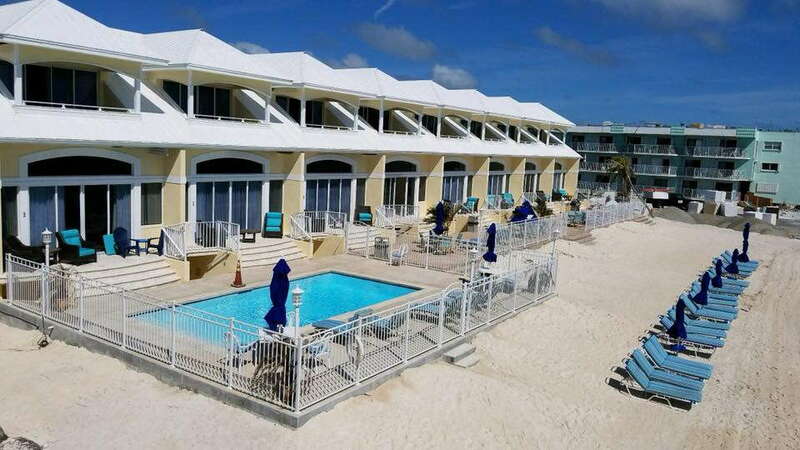 They also own the tri-level villas next door, so you could stay in your own oceanfront palace with 2300 square feet of space and a private garage. That hipster vibe can be found in the bathroom area, too. Flattering backlit lighting, a rolling glass shower door, modern tile, a separate makeup area, lots of thoughtful touches including a plush bathrobe, thick towels, and good bath supplies. Step in and you’re right at the check-in counter. Colors and paintings are reflective of the oceanfront setting. Staff is very friendly. YOU SHOULD KNOW The elevator is tiny--really tiny. You and your luggage may not fit in at the same time, and that is not an exaggeration. It's just a big rectangular heated pool but it’s right on the ocean and the herringbone patterned pavers are a nice touch. Towels are in your room. Plenty of loungers set around the edges. There is a also a hot tub. There is a fitness center on the ground floor by the lobby with one treadmill, a bike machine, some free weights, and a TV. But the best feature is the view of the pool and ocean. 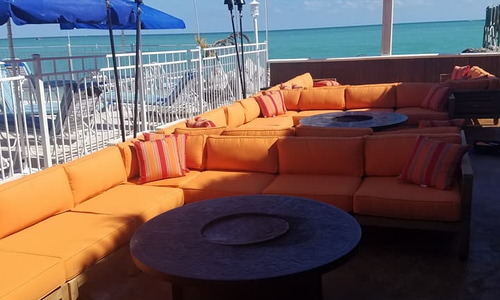 Havana Jack’s Oceanfront Restaurant & Bar is practically attached and they serve food daily from 11 a.m. to 9:30 p.m. 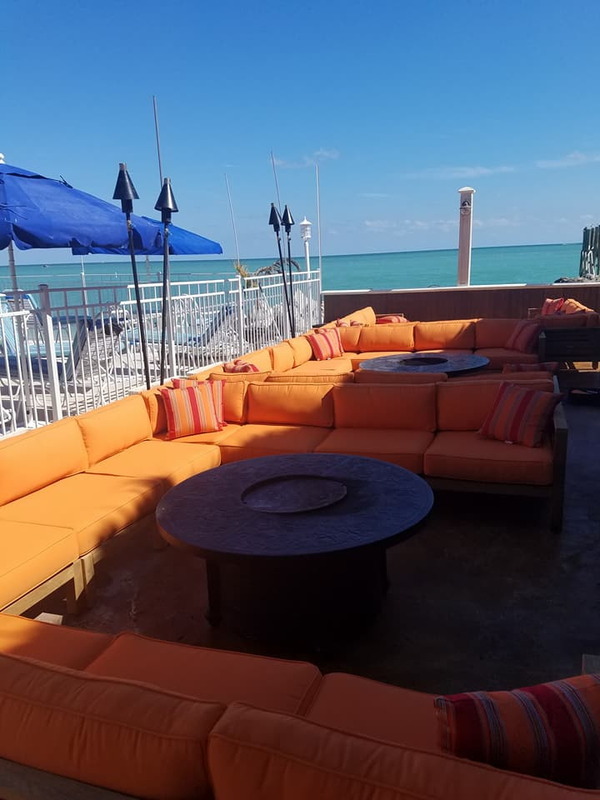 Lounge comfortably in sofa-style seating areas on oceanfront deck or dance under the stars to the live music. You also have a full kitchen (in suite) and a BBQ grill on site. You're just steps away from Havana Jack's. Their full liquor bar serves drinks until midnight. One of the few resorts that have an accessible beach where you can simply walk right in the water. Just know that the sand onshore for their beach area is not soft, it's rough like most Keys' beaches, because of the coral reefs just off shore. 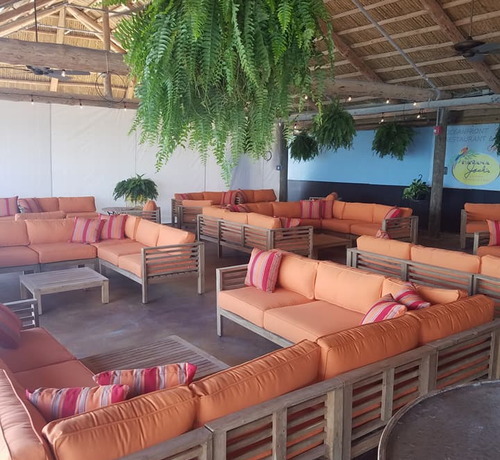 There are plastic woven loungers, tables, chairs, umbrellas, hammocks, and even a fishing pier to make full use of the oceanfront location. Key Colony police are very diligent so don't drink and drink on this island. Have the resort staff drive you via golf cart to local spots, or to explore further, take your own vehicle. The Stuffed Pig (10-minute drive) is a local favorite for breakfast and lunch. Small on the inside with under-the-tiki seating outside, they serve a hearty breakfast and an awesome Lobster Reuben. In addition to a great Sunday Brunch, the Key Colony Inn (8-minute walk) serves up fresh seafood and Italian favorites. Leigh Ann’s Coffee House (7-minute walk) is a must-do for either breakfast or lunch. Homemade granola, great coffee, pastries and biscuits... and for lunch, it’s tuna all the way. 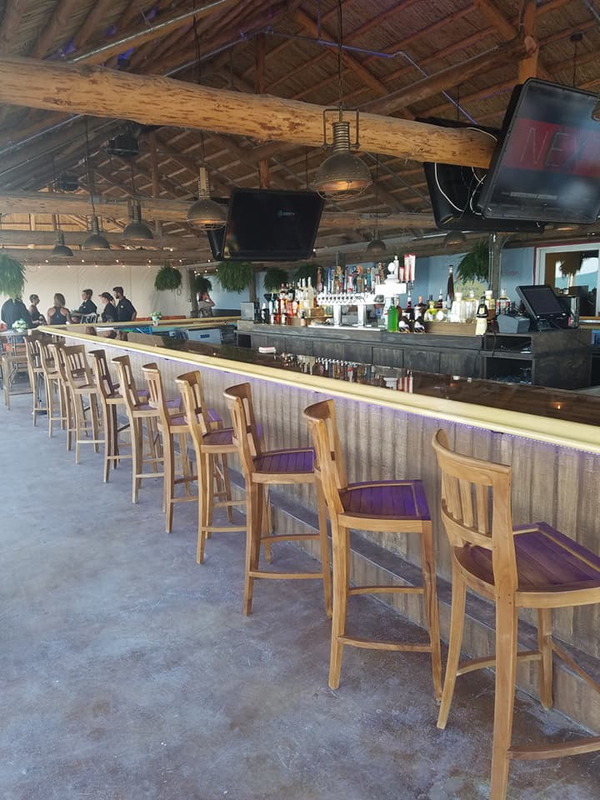 Havana Jack’s (1-minute walk) is the oceanfront bar (and restaurant) right next door. It’s fun and convenient. 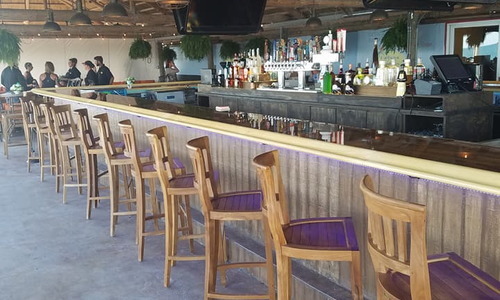 Sparky’s Landing (8-minute walk) offers a marina setting, plenty of locals and cold drinks. Island Fish Company (4-minute drive) is most recognized for its enormous Tiki hut. It's a touristy place but the atmosphere is fun and they have happy hour. 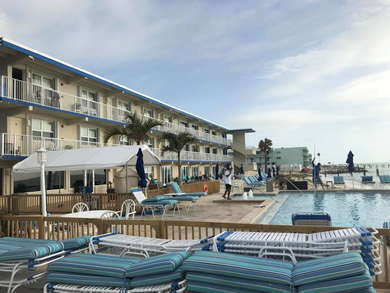 When this was a timeshare resort, the Glunz family would travel from Europe every year for their vacation week. When it went up for sale, they couldn't bear to see this gem of a vacation spot ruined by a big developer, so they bought it. Lucky us! Now, you're part of the family when you visit and you'll feel it from the first "hello." Colorful Key-zy rooms, quality blenders that can handle pina colada-making all day...lots of little touches that add up to big guest satisfaction. Key Colony is a great little island to explore on its own too, and you're close enough to the sites in Marathon and beyond.